When you are looking for board games for parties and family gatherings, don't be afraid to try something new. 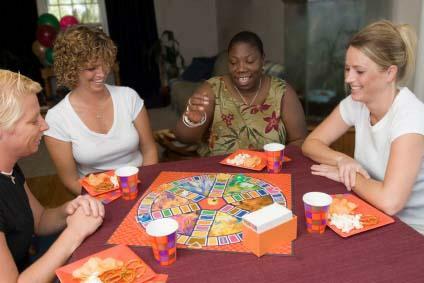 With the choice of the right game, a quiet, boring get together can be transformed into a lively event. There is nothing like a game to take a ho-hum gathering to a fun, laughter-filled occasion that everyone will be talking about. Quiet, shy wallflowers can suddenly turn into vivacious, energy-filled personalities while they focus on winning. A group of people who have nothing in common can gel as a team with a common goal to beat the pants off another team. Even the finicky, sullen teens at your family gathering will suddenly come alive as game players. Ages - Some games work well for a wide variety of ages, while others work best for teens or adults and some games really should be reserved for adult-only play. Number of Players - Look for games that lend themselves well to team and group play. Player Interests - Games are now available that can tap into the special abilities and interests of players. Movie or song-themed trivia games, word and picture guessing games and question/answer games may be just the ticket for your party attendees. Look for types of games that fit the personalities of the players. Active people like active games. Thinking people like thinking games. Start your game search by looking at games that will be of particular interest to the ages of the party attendees. Then, narrow down your choices by finding the game that best matches the interests of your party goers. Twister Board Game Twister - A high-energy game that can be played inside or outside. For two to four players or teams, ages 6 and up. Scene It - A fun trivia game available in many versions including movies, television and comic books. For teams, ages 8 and up. Family Feud - Based on the popular television show, players can form teams and compete by answering questions. For ages 8 and up. Are You Smarter Than a 5th Grader Board Game - A fun game for family gatherings. Play as teams, with kids against the parents for extra fun. For ages 8 and up. Apples to Apples Board Game Instructions Apples to Apples - A card-based word matching game. All players are involved in each short round. Game cards can be personalized. For four to ten players, ages 12 and up. Battle of the Sexes - Good team play with men against the women. For up to eight players, ages 12 and up. Sherlock Holmes: The Case of the Dead Duke - This role-playing game involves players in finding clues and then participating in the court trial. For up to ten players, ages 12 and up. Boxers or Briefs Game - Players take turns answering revealing questions about themselves. This is a great ice-breaker. For teams, ages 18 and up. Dirty Minds - This game is called the "World's Cleanest Dirty Game." Suggestive clues lead players into sometimes revealing answers. For teams, ages 18 and up. Catchphrase - A high-action, fast-talking game. For teams, ages 18 and up.